Our shipping is crazy-fast to get you back on track ASAP! 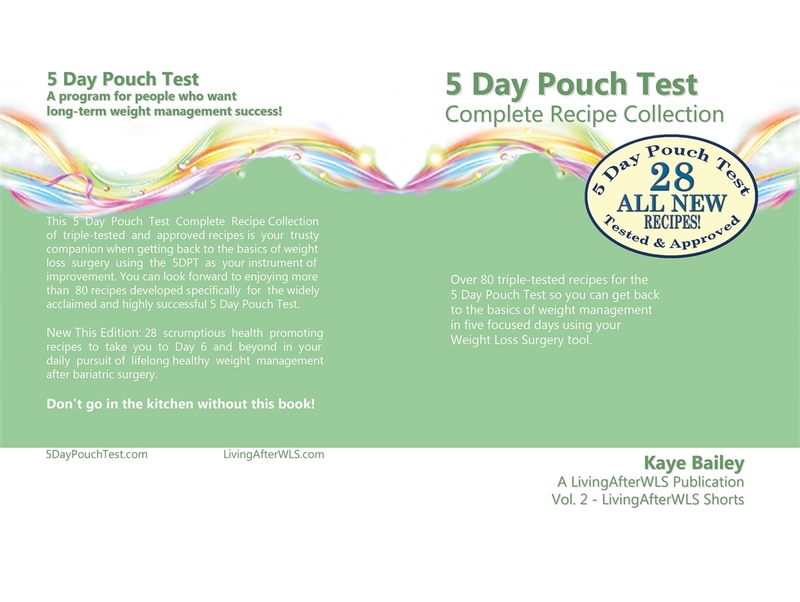 The complete 5 Day Pouch Test Recipe Collection takes you into the kitchen for your successful 5 Day Pouch Test and Beyond! Using the plan and this treasure trove of recipes you can get back on track with your weight loss or weight maintenance goals after having weight loss surgery. A must have for anyone serious about using the 5DPT as their instrument of improvement. Amazon Prime: Prefer to take advantage of your Prime membership? Our titles are listed in Books and Kindle. Go to Kaye Bailey's page to find our latest titles. Digital Editions: Prefer eBooks? Search Kaye Bailey on your eBook app to find our latest digital titles. 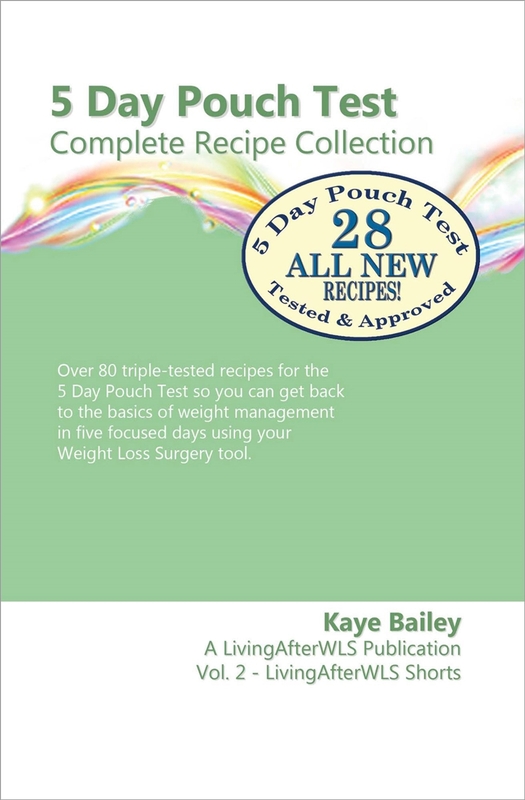 What’s in it: Over 80 triple-tested recipes for the 5 Day Pouch Test so you can get back to the basics of weight management in five focused days using your weight loss surgery tool. New This Edition: 28 scrumptious health promoting recipes to take you to Day 6 and beyond in your daily pursuit of lifelong healthy weight management after bariatric surgery. Who it’s for: The 5 Day Pouch Test Complete Recipe Collection is for those who want to learn a little more about the plan and have the convenience of 80 triple-tested recipes in one handy book to go from the kitchen to the market and back again. The 5 Day Pouch Test is for people who want to succeed long term with their weight loss surgery tool. United States Readers: Find this title and other Kaye Bailey Books on Amazon.com. 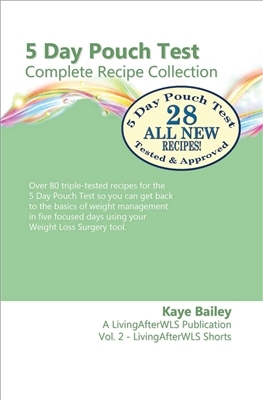 Australian Readers: Find this title and other Kaye Bailey Books on Amazon Australia Services, Inc.
Over 80 triple-tested recipes for the 5 Day Pouch Test so you can get back to the basics of weight management in five focused days using your weight loss surgery tool. This convenient booklet is your trusty companion when getting back to the basics of weight loss surgery using the 5DPT as your instrument of improvement. You can look forward to enjoying more than 80 recipes developed specifically for the widely acclaimed and highly successful 5 Day Pouch Test. New This Edition: 28 scrumptious health promoting recipes to take you to Day 6 and beyond in your daily pursuit of lifelong healthy weight management after bariatric surgery. The Complete Recipe Collection is Volume 2 in our LivingAfterWLS Shorts collection and was previously only available in eBook format. By popular request we present it now to you in paperback form, a handy booklet size of 5.25x8-inches, convenient to go from kitchen to market, all presented in traditional print on quality paper bound in the "Perfect Binding" publishing tradition. A terrific value! Don't go in the kitchen without this book! "This has helped me get back on track losing weight! Worth getting the recipes so that it is easy to plan meals." Absolutely love the recipes & info in this book. Can't wait to use them. Put together in such an attractive & informational format. Thanks for free shipping, Will look forward to future offers. Nice new recipes that I know I'll be making alot.